La Carlota Department of Education (DepEd) represented by its schools division superintendent who was among the honored guests lauded the Church program on family in a culmination program held at its local Church meetinghouse. La Carlota Philippines District of The Church of Jesus Christ of Latter-day Saints (LDS) has culminated its own unique activities of National Week Celebration after having a selected Family Home Evening (FHE) in the barangay, in the school. The city of La Carlota through its acting city mayor, VM Jacky Jalandoni attended the morning program of the Church culmination activity with other invited guests from government's Pantawid Pampamilya Program of the marginalized members of the society and also from the Philippine Anti-Children's Trafficking (PACT). 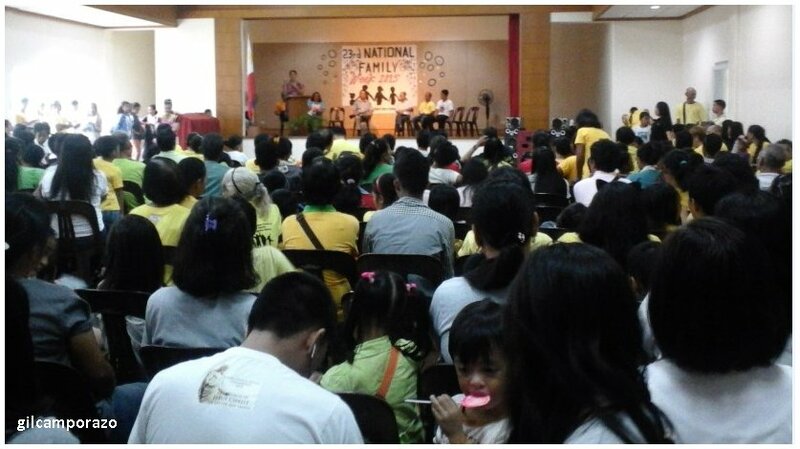 "Gender Equality and Children's Right for the Contemporary Filipino Families" is this year's theme for the National Family Week celebration. SDS Portia M. Mallorca of La Carlota DepEd who came to La Carlota meetinghouse in San Agustin Street for the first time was grateful for the invitation of the Church. 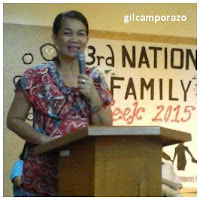 She relayed that the DepEd has its own family activity among the teachers too but it is usually held during December. Anyway, feeling grateful of the amenities afforded her by the local Church, she lauded the organizer of this family activity which was participated in by the 8 branches of the District. She praised the Church leaders particularly President Mario A. Malacaman who is also an elementary teacher by profession under the Division of La Carlota where she's the head on this wholesome gathering by families within the area of La Carlota Philippines District. Since most of the audience were group of families composed of a father, a mother and the children, she wanted to share this "gifts" principle as a guidepost in having a happy and successful family. 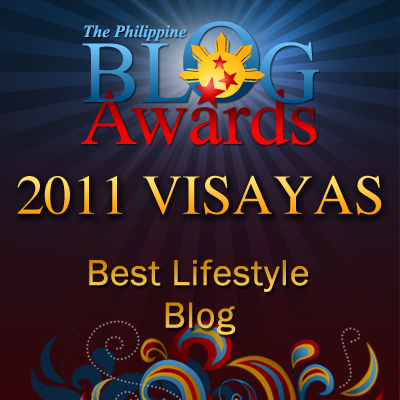 Before she unfolded them one by one, she stressed that family should come first. She paraphrased the oft-quoted statement of Church President Harold B. Lee's "No Success Could Compensate for Failure in the Home." Thus, she said no successful professionals if his or her family fails. Meaning, everyone in the family is not happy, no communication. There is a gap among the members of the family. Misunderstanding is evident. She elaborated how those loopholes may be remedied through an acronym of GIFTS which stands for God, Individual, Family, Togetherness and Sharing. There was an instance that she shared her gift of singing. She interpreted a certain song just to complete her explanation of this GIFTS principle. Those in attendance were families members coming from the branches of San Enrique, Ayungon in Valladolid, La Carlota First and Second, Masville in Brgy. Cubay, Manggapsang in Brgy. Haguimit, La Castellana, and Moises Padilla in Negros Occidental. 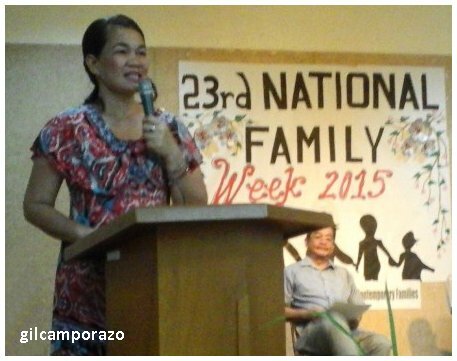 La Carlota meetinghouse was venue of this one-day culmination program of National Family Week celebration for 2015. It's definitely rewarding to celebrate something as good as your own family. Everyone who participated has the right to be recognized. My son has family day celebration in school and it is really nice event for family bonding. I agree with the quote because there are successful people but failure in their home because they did not give more time. Family day is an amazing school event. It helps promote the importance of being together with the family. Looked like a fun event. And I agree that family should always come first. "No success could compensate for failure in the home." Very true. No amount of money, job promotion, or popularity could top happiness at home. I agree with her. Family should comes first. We can lose everything but our family will remain with us no matter what. We cannot be fully successful if at our home is not whole. Btw sir, belated Happy Teacher's Day. Good thing you had that in your area. We haven't celebrated Family Day yet. This looks like a fun event. Like what she said "Family should come first" and it is very important that we must cherish every moment we have them. Family will always there for you no matter what happen. Recently, my son had their fun games and parents were all invited. However, there are only few who attended the event. Though I took leave from work. I guess I am happy attending the said event. It only shows how you support your kids and help them boost their confidence.